Sorry it’s blurry…we were trying to maintain a speed strong enough to break the hold Texas seemed to have on us. Louisiana has it’s own vibe and you feel it pretty much upon entering the state. It’s a mixture of Southern Hospitality and a splash of the French laissez-faire attitude, combined with the Caribbean concept of “Island Time”. Which means it’s perfect…unless you’re in a hurry. At restaurants and bars you will most likely have to flag down the waitstaff to get your bill and then wait for them to feel like processing it. Our spot at Maxies…there are a lot of huge Live Oak Trees in the campground as well…but not enough to block our satellite reception!! We stayed at a Maxie’s Campground in Broussard near Lafayette (which we soon learned is basically pronounced Laugh-yet as opposed to the town by the same name in California which is pronounce with 3 distinct syllables La-fiy-et). Thanks again to Passport America, we scored a 50 amp site for $12/night. The owner was amazingly friendly (shouldn’t all owners be friendly??) and we were able to have our pick of sites. The only downsides were that there was no wifi (which frankly, we’ve come to grips with the reality that even if a campground offers wifi you will most likely not be able to connect anyway) and it was literally right off the highway…as in, the rigs parked on the right side of the park had a fence, a ditch and then the highway as a backyard. It didn’t bother us much (there is a rush hour at about “it’s still dark out” o’clock) but we were only there for 2 nights. 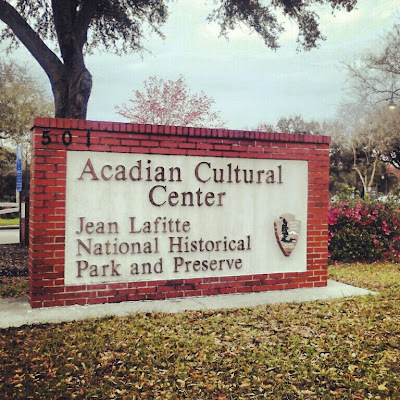 We did venture out into the area to check out Acadian Cultural Center of Jean Lafitte National Historic Park (there are 6 sections of the park throughout southern Louisiana) and learned about how the Acadians were tragically forced from Nova Scotia, Canada and resettled in Louisiana to become what we now call Cajuns…and the story of Evangeline. 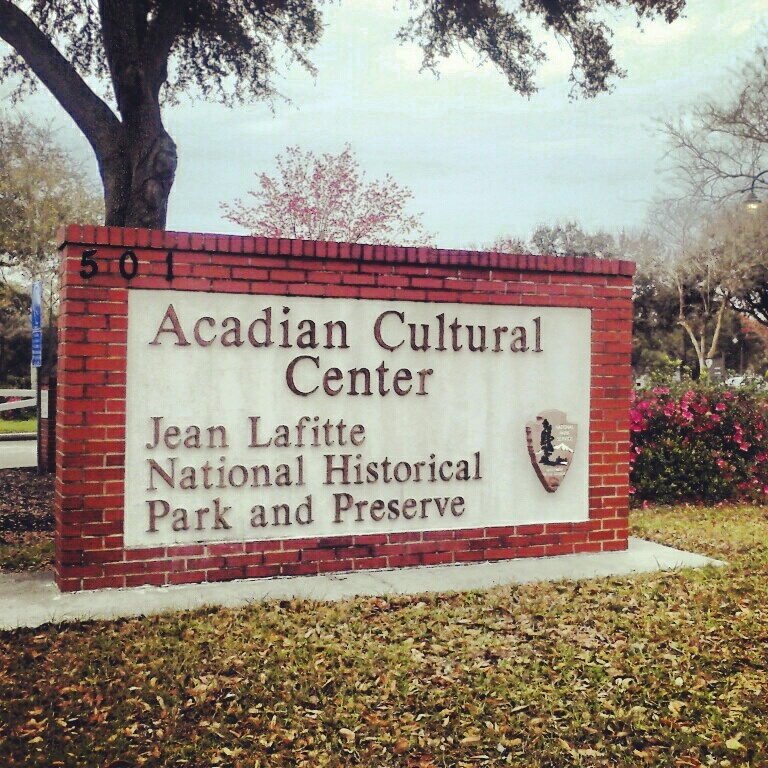 All very fascinating and well worth a visit…after all, Louisiana is a very unique place and becomes even more amazing when you learn the history behind it all. Yep, we are those people…we take pics of our cocktails…ervery where we go. The only other place we visited in the Lafayette area was the Blue Dog Cafe…mainly because of the art. 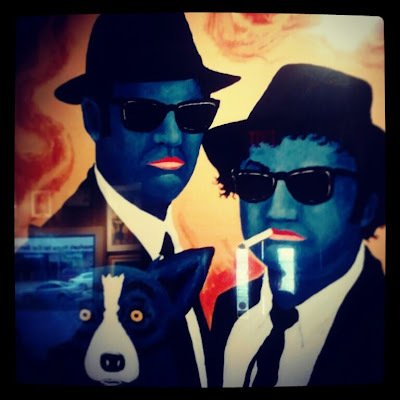 Artist George Rodrigue grew up in nearby New Iberia and spent much of his adult life in Lafayette. He’s also been know to frequent the restaurant, talk with customers and sign autographs. He’s a very charitable guy and the epitome of that ‘Louisiana’ Southern Hospitality. Although we didn’t get to meet him, we did enjoy his restaurant (where you can buy his art or books) and everything we tasted…but especially the Portobella Pizza, honey butter and to-die-for bread pudding (do yourself a favor and just buy some out of the freezer so you can relive the experience over and over). They also make a killer Cosmo (like with a lot of vodka). 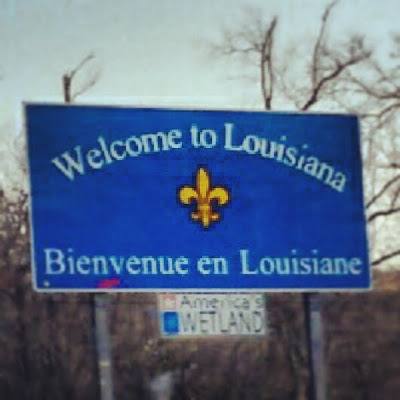 And, in true to form, it took longer for us to get our check and pay than it did to eat our meal…welcome to Louisiana. Glad to see you enjoyed your time in Louisiana – that is where I grew up and I agree, it is a very unique place! We're hoping to swing through there and spend some time in a few months. I'm really enjoying reading your blog! Thank you!! We really loved our time there…and our next post may well be a doozy because I've finally caught up to the full week we spent in New Orleans…yikes! As a matter of fact, it looks like we are going to head back for Marde Gras next spring. Not sure of our route (although we will be coming from Alabama and continuing on to maybe the New Mexico/Colorado area). Perhaps you can suggest some places to visit? Places to visit in Louisiana or NM/CO? I haven't done Louisiana in our RV yet – the only places I know about are the French Quarter Resort and one of the state parks in Madisonville. However we did go through NM/CO in the RV just this summer so would be happy to suggest some places there if that's what you meant! Ouray, CO is a MUST do! We had no plans to go there originally – but we met a couple in Durango who invited us to follow them there, and we were so glad we did. We loved the city. So cute, great hiking, great restaurants/breweries, and walking distance from the RV park (4J+1+1 RV Park.) Durango and Pagosa Springs were great too. In general Oregon has been my favorite place (we've been here for close to two months!) but CO is a close second. I've heard southern Utah is amazing but we skipped it on the way here because of the heat. As for NO, I've heard that there is a RV park on the west bank (you'd have to take the ferry to get to the Quarter), but I don't know much about it. The park in Madisonville is beautiful, but you have to drive across the Causeway (over the lake) to get to NO. Not ideal after a day of watching parades! I'll ask some of my friends who still live there and see if they can suggest something! While you are in the area, not sure which way you are going, check out Betty's…….http://www.bettysrvpark.com/. It is not too far from where you are now. it is an RVers must do. We have notbeen there yet but everyone who has say it is a must stop. We'll be there in May. We will also be in New Orleans in June. Sounds like you are having fun. Lynn, FInally got caught up on your travel blog after finding the other one through Ellen. Will enjoy following your RV journey as well. Kind of interesting twist following your trip through Louisiana when I know you've recently been in Indiana and are now in Ohio. I well know how hard it is to stay current. But there's life out there waiting to be lived…write about it when you can. That's how the writing stays fresh and doesn't become a "job."